Dimensions: Hook: 1-1/2? long. Staple: 3/4? high x 15/16? wide. Medium-weight hitching ring is for animal tie-downs and other home and farm applications. Includes 2" inside diameter ring #0 wire, welded (.300 diameter). 3/8" diameter screw eye. Boxed. Medium-weight hitching ring is designed for animal tie-downs and other home and farm applications. Includes 2" inside diameter ring #0 wire, welded. Plate is punched for #14 screws or 1/4" bolts. Boxed. 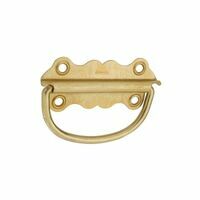 Designed for use on chests and doors where handle sets flush with surface. Recessed handle for total flush mounting. Four screws included for secure mounting. Safe working load 100 lbs.